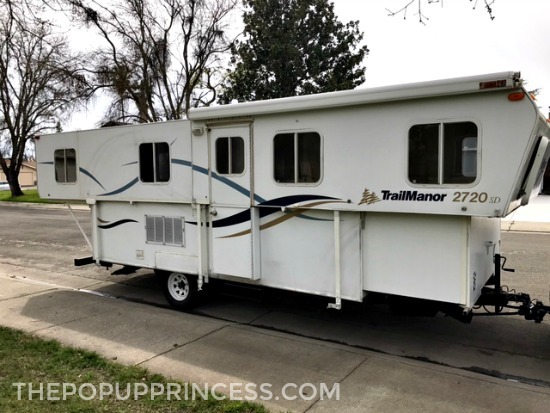 A Trailmanor gives you the convenience of a pop up camper with the features of a traditional travel trailer. 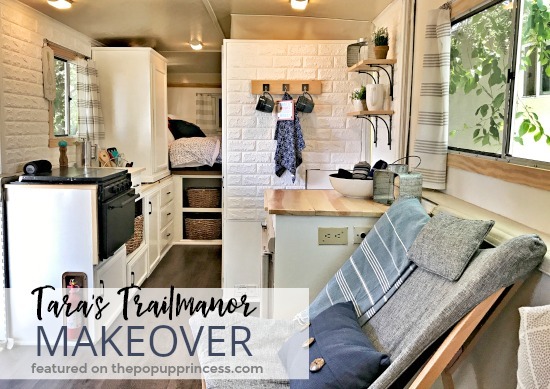 Tara took her tired, old Trailmanor and transformed it into a gorgeous, modern home away from home. Years ago, Tara had a vintage 1964 Shasta with the intentions of fixing it up. Life happened, and that project got pushed down to the bottom of her priority list. We can all relate, right? Eventually, Tara sold that Shasta, and it became one of her only regrets in life. 😉 Last year, Tara decided to start looking for another trailer. She has a Honda Pilot, and so she is limited on towing capacity. This led her to look into pop up campers. You see where this is going, right? Familiar story… she stumbled onto the blog and was hooked on all the creative pop up campers you guys have shared. She especially loved Jenny and Mike’s Trailmanor Makeover. Tara started researching Trailmanors, and as luck would have it, found one about an hour away. It was perfect, and she bought that 2001 Trailmanor 2720 for $6200. She just couldn’t wait to get started with her makeover and dug right in. Tara is a home stager, so she has seen quite a few different decor styles. 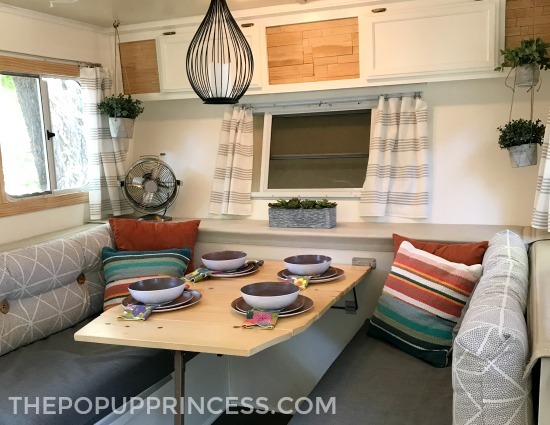 She says she loves many of those looks, but decided she wanted something clean, bright, and a bit on the modern side for her camper. 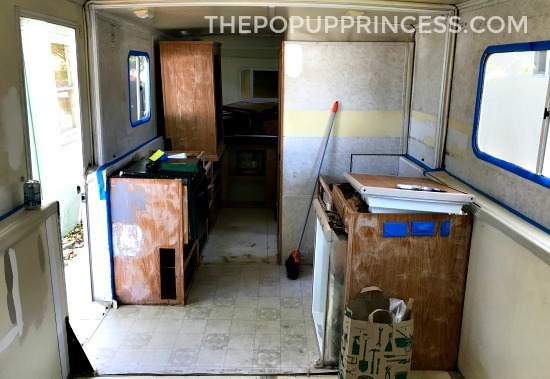 She started by gutting the Trailmanor, taking off and removing all the doors, the countertops, upper cabinet, three-drawer chest, and the old, icky carpet. Then Tara began the tedious process of painting. She wanted to make sure that the paint held up during the process of folding down and popping the trailer up and down, so she didn’t skimp on the prep work. Tara sanded and deglossed all the cabinets, doors, and drawers. 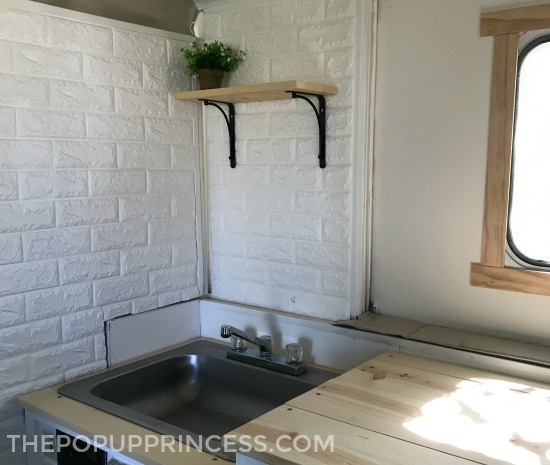 Then she applied two coats of primer and two coats of paint, using Dove White on the cabinets for a bright clean look and Navajo White on the walls for a softer feel. She loved the look of wood counter tops. Tara has them in her house and says they are easy to maintain, so she went with the same idea for her camper. She used common stock pine, which is cheap. 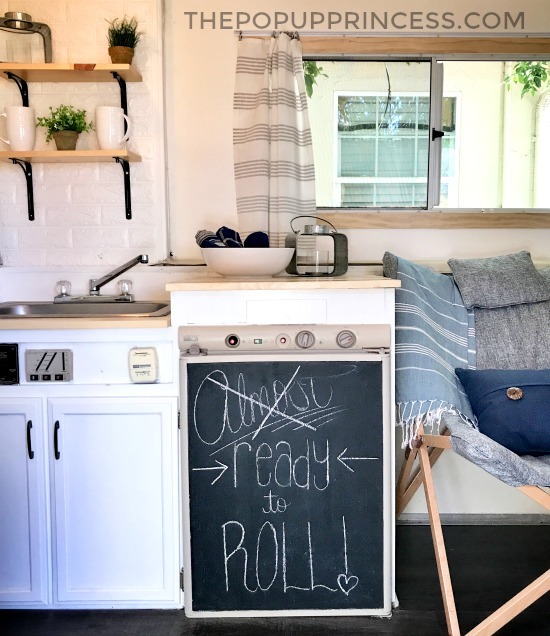 She says the weight difference between the old counter tops and the new pine ones is negligible, and she is really drawn to the natural look of the wood, knots and all. 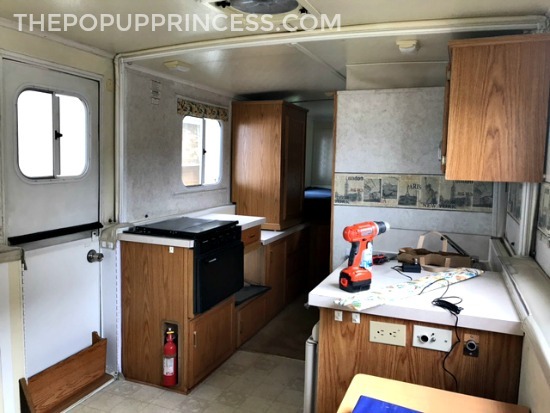 Since it is a camper, Tara was not too concerned that everything be “perfect.” She also liked the rustic industrial look of leaving the screw heads exposed, so to make the countertops, Tara simply screwed her boards to the existing braces of the old counter tops. Both the new countertop and the old are the same thickness, so with just a slight bit of finagling they fit very well. She gave them all a coat of satin polyurethane to protect the tops, and that was it. Because she loved the clean look of the natural wood, no stain was even necessary. Tara used four boxes of Clarksville Oak plank vinyl for the flooring. It has both brown and gray tones and hides the dirt well. Tara says Trailmanors are like origami trailers, 😆 so she had to be very cautious adding anything because of the way the walls fold in. Additional weight was also a huge issue for Tarag, so she tried to keep all of her modifications on the lighter side. She found some lightweight faux brick foam wall panels that were inexpensive and SO easy to install. All in all, she spent $55 on 10 panels (she only ended up using six of those), and only needed a pair of scissors for the install. Most Trailmanors have an upper cabinet that you attach to the wall after you raise the roof. Tara felt like it really didn’t add a lot of storage, and, when filled, it was difficult to lift and hang. She replaced it with two shelves to hold cups and other small items. She also removed the standard 3-drawer chest for a similar reason. She felt her Trailmanor had a lot of storage anyway, and Tara likes to travel light. If she ever feels like she needs more storage, she can always replace that chest with something more convenient. For now, she loves the extra space, and has filled it with an awesome butterfly chair (available on Amazon here). Next on Tara’s list was the upholstery. When she went to Joann to pick out the materials, they were having a huge sale on outdoor fabric. She also had an online coupon, so she spent a total of $30 for all the supplies to reupholster the dinette. Tara can’t sew, but her mom can, so she recruited her to cover the dinette cushions. 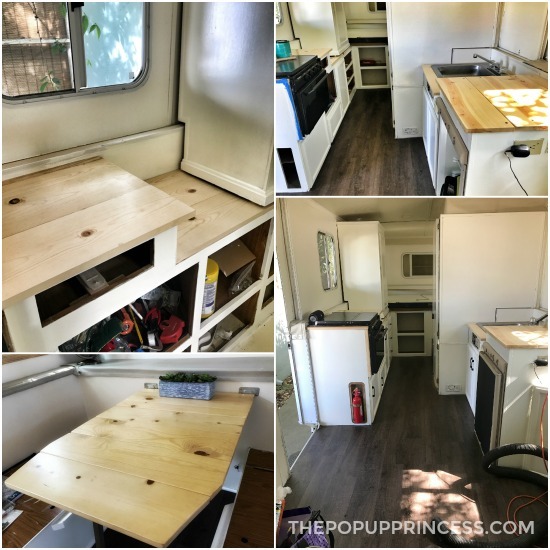 She replaced the table with the same common stock pine boards, and reused the hardware. She framed out the windows with some trim she got at Home Depot and made inexpensive curtains from Target tablecloths. 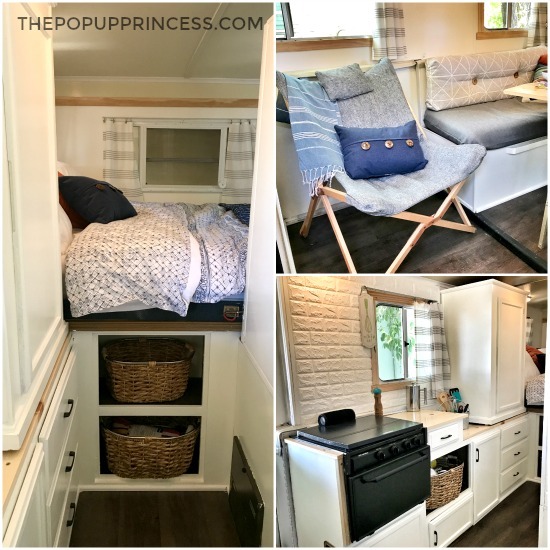 When Tara and her mom finally took the trailer out for it’s maiden voyage, everything was perfect. She immediately began planning many more camping trips and is looking forward to enjoying her new home away from home. 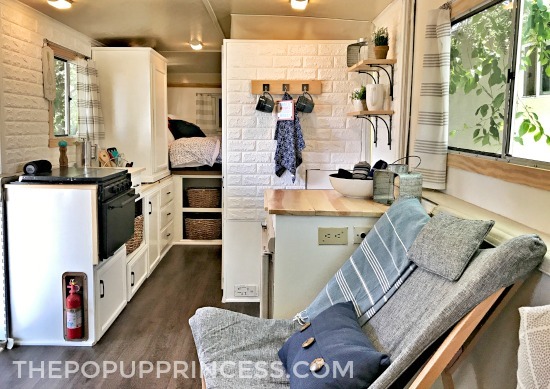 She loved the whole remodel process so much, she is already looking for another project camper–but she says she is going to take a little time to enjoy her new Trailmanor first. Thanks so much for sharing your gorgeous remodel with us, Tara. I’m in love with it, and I know you’ll inspire a few Trailmanor owners yourself. They really are the best of both worlds as far as convenience, and with a little hard work, they can be gorgeous as well. These makeovers make me want every trailer on earth! I love it! I almost bought a Trailmanor this summer and may do so in the future. My biggest complaint about the Trailmanor is that I did not like how narrow the “hallway” between the bathroom and kitchen felt. I actually felt more closed in than I do in my tiny pop up. This remodel is great. Removing some cabinets and brightening the colors appears to open it up more. I love love LOVE those tufted back cushions on the dinette! That oversize button – is it leather? Did you remove the plastic wall covering to expose the wood before you put the foam “bricks” on?